Black Cohosh is a beautiful plant growing 4—8 feet (1-2 metres) high with small white feathery flowers in graceful slender spikes. It is a hardy perennial, native to the shady woods of North America and Canada. The name Cimicifuga derives from the Latin cimex, a bug, and fugo, to drive away, as its rank smell was known to repel insects; this explains its names bugwort and bugbane. From Siberia and India to Europe, bugbanes like black cohosh have been used for centuries to drive away insects. 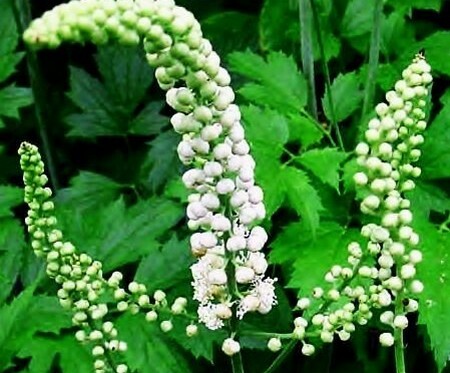 Black cohosh was a popular medicine among the indigenous tribes of America who called it squaw root because of its great ability to treat uterine disor­ders and to aid childbirth. In 1831 a certain Dr Young introduced black cohosh to the American medical world where it was used for a wide variety of ailments including heart problems, epilepsy, bron­chitis, whooping cough (it was considered one of the best remedies for this), rheumatism, neuralgia, hyste­ria, menstrual problems, scarlet fever, measles and smallpox. It became a leading remedy in America for acute rheumatism, arthritis and neuralgia. In both America and China black cohosh was considered a powerful remedy to antidote the poison of rattlesnakes, to ward oft old age and as a general pre­ventative against disease. It was also famous as a nerve tonic, to relieve depression with fear and dread of impending evil. Tea made from the roots was sprinkled in a room to stop evil spirits from entering. The root of black cohosh is specific for nerve and muscle pain. It was widely used by the native Americans for treating neuralgia. The anemonin in the plant depresses the central nervous system, mak­ing it an excellent pain reliever for a range of prob­lems including rheumatoid and osteoarthritis, headaches, ovarian and uterine pain, contractions during childbirth and breast pain. The salicylates with their anti-inflammatory action are helpful in pain relief. It is a good remedy for tinnitus and vertigo. Black cohosh has an antispasmodic action, easing cramping and muscle tension and can be taken to relieve asthma, whooping cough, menstrual cramps and painful contractions in childbirth. Taken several weeks before the birth, it prepares the uterus for childbirth. It normalizes the function of uterine mus­cles, helping them to work as effectively as possible to enable a safe and easy delivery. Black cohosh also relaxes and dilates the muscles in the blood vessels, helping to lower raised blood pressure. While acting as a sedative to the nerves and a relaxant to the mus­cles, black cohosh also normalizes heart function. It strengthens a slow and irregular pulse. Black cohosh has a generally very beneficial effect on the female reproductive system. It can be used to treat menstrual pain and irregularities, heavy bleeding and breast pain and swelling. It strengthens the uter­ine muscles and with its oestrogenic properties helps to relieve problems associated with the menopause such as depression, hot flushes and low libido. Cimicifuga is useful particularly for women who are prone to bouts of depression, as if a black cloud has descended on them with a sense of impending evil. This is likely to occur during pregnancy or after childbirth and may be accompanied by a great tear of losing her senses or of dying. The bout of depression is followed by excitable, even manic behaviour. Cimicifuga, like the herbal remedy, is recommend­ed to relieve muscle and nerve pain. It is also a good remedy for female problems such as ovarian pain, irregular periods, heavy bleeding, pains after childbirth and breast pain. Black cohosh is for women, particularly those prone to dark, morbid thoughts and who tend to become caught up in destructive relationships in which they feel powerless. This negativity may express itself in physical illness, particularly in the reproductive sys­tem. Black cohosh increases your positivity and ener­gy to transform negative, threatening circumstances into ones that are more life-enhancing and fulfilling.